LeapPad tablet has a 5-inch color touchscreen, 480x272 resolution. Has built-in camera and video. 2GB Storage (non-expandable). But you can move the apps on and off by connecting to PC. 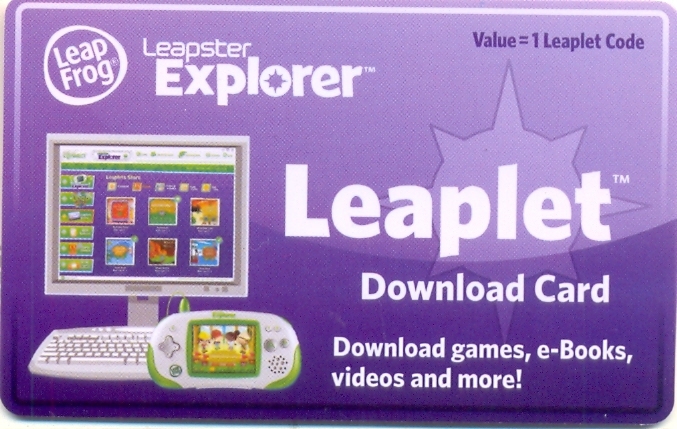 Installation CD included or you can download the LeapPad installer online. On Pet Pad App, you can "buy" treats or shampoo using tokens and badges earned from learning and games achievements. The 100+ cartridge games, apps, digital books, videos and flash cards are sold separately. Patiently waiting to finish download and sync to computer. 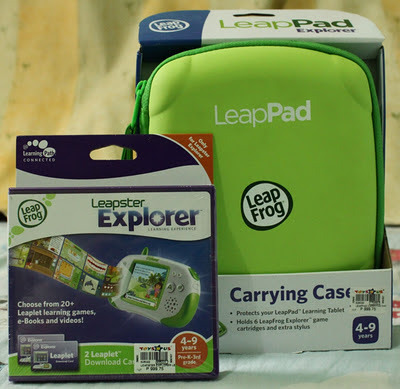 Addicting as it is, i invest on LeapFrog LeapPad Explorer Carrying Case to protect the handheld for learning fun on the go! 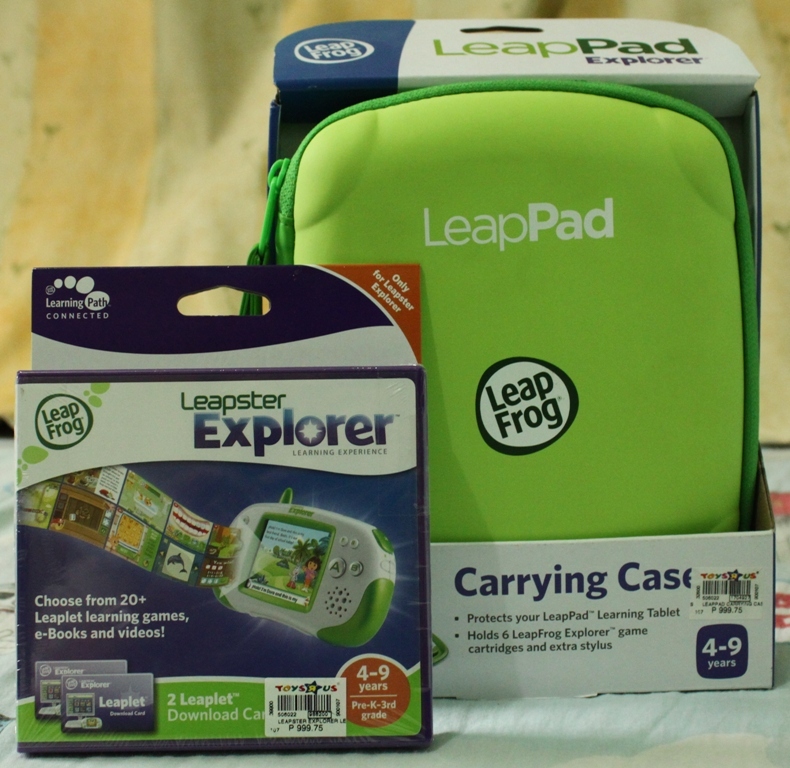 I bought it from Toys R Us in Alabang Town Center, together with this LeapLet Download Card both for Php999.75 each. I admit its a bit expensive that really takes a "leap" on my out of budget expenses border. 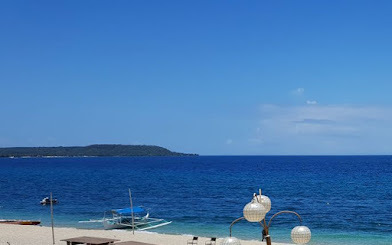 But i'm quite determined on creating a fun learning way for my only child so i took it, blocking out all the spending hesitations...( am i hearing a bid of goodbye to my dream ipad2? sigh*). Download pack contains 2 leaplet download card. I bought this Leaplet download card, expecting to have 2 apps worth $10 each but to my dismay, when i redeem the code my account loaded with just $7.50 for each card... (tsk! bad). My son's choice of app to download is the Roly Polly Picnic game (love the tilt sensor!) worth $10 so i was left with $5 on my account. That means i have to spend more and more for every apps. I searched for the cheapest download card offered online and found the lowest App Center Download Card for $14.99. Next time, i'll make a purchase from this ebay seller that agreed to directly email my code after the payment. Overall, i would most likely recommend this product and introduced the new generation of learning, digital reading and personal creativity for children! thanks for the review mommy;-) we are considering a vtech laptop for my daughter's bday gift, glad to see we have more options. its also a good investment to add up on your educational toy collection. 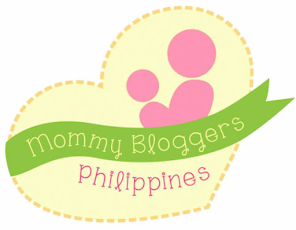 But if you don't mind spending more, better opt this LeapPad, the newest gadget for you techie little one, it also comes in pink. This is cool. Parents who are thinking of a good Christmas gift should consider buying LeapPad for their kiddo. We got a really good deal on this. We paid $64 at the Barnes and Noble. My 3 1/2 year old loves the leap pad. The only thing I see that it's crazy is that the game pet pals you have to log in once every day to get treats for your puppy. I noticed that we got tokens but we can't use them to buy the treats. It's just kind of annying that you have to log in every day and only once a day. $64 was really a bargain for a brand new leapPad. Sadly true, it requires you to connect to computer for treats and shampoo as their way on ensuring that new updates will be installed.